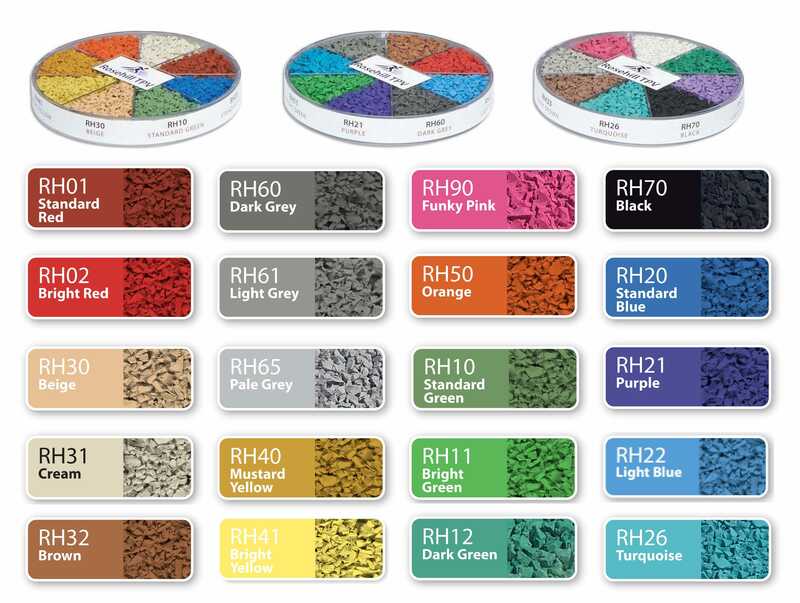 With an advanced chemistry and over 20 colours to choose from, Rosehill TPV® is the perfect rubber granule for anyone who designs indoor or outdoor sports and play surfaces. From architects to installers, Rosehill TPV® will more than meet the requirements of any specifier and exceed expectations. Rosehill TPV® outperforms other coloured rubber granules in terms of UV stability simply by utilising the most advanced additives and pigments. These are combined with one of most innovative thermoplastic elastomer base polymers at relatively high levels to give a colour fastness that is superior. Not only does the colour last for longer but the granules do not harden over time either as the material is cross-linked using peroxide which also offers excellent material stability in comparison to sulphur-cured granules. Our unique colours are identified with the colour codes so you would need to use the colour code and name to ensure you get the correct colour that you want. Note: Please check on availability of colours when placing an order. Some of the colours may not be in stock so would then need to be ordered from Rosehill Polymers in the UK. See below our colour chart.